This film is not a biography. It is a portrait of the man as he builds his crowning achievement. 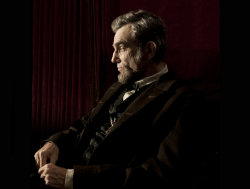 Daniel Day-Lewis will be the image of the President for many decades to come. The direction is good. The film is steadily paced, made up of many moving, picturesque images. All the actors did wonderful jobs. It was a pleasant surprise to see Hal Holbrook. A few actor choices, such as Joseph Gordon-Levitt, seemed more like adding names as the parts could have been handled by others. But the choices did help guarantee good work. John Williams did a nice scoring job.